For some time, the conventional wisdom (and I largely agree with it) around the upcoming midterms has been that Democrats are modest favorites to win the House, while Republicans are likely to hold the Senate. Democrats, who have 49 Senate seats at the moment,1 might win GOP-held seats in Arizona and Nevada, but it seems likely they’ll lose at least one of the 10 seats they hold in states that President Trump carried in 2016. But the 2018 Senate map is shifting — mostly in ways that make it more likely that Democrats could flip that chamber too. If you’ve only been paying attention to the House, it’s time to check back in on the upper chamber. Our poll of the week, for example, comes from Tennessee. In the race to replace retiring Republican Sen. Bob Corker, Democrat Phil Bredesen (Tennessee’s former governor) leads GOP Rep. Marsha Blackburn 45 percent to 35 percent, according to a Middle Tennessee State University poll of 600 registered voters.2 (Blackburn and Bredesen are almost certain to win their respective parties’ primaries in August.) Seventeen percent of voters were undecided. A poll in December showed the two effectively tied, so this MTSU survey could be an outlier. And I’m skeptical Bredesen will win by double digits in ruby-red Tennessee, where Trump won by 26 percentage points in 2016. But at the same time, Bredesen has deep roots in the state. He was the mayor of Nashville, and then got himself elected governor twice (in 2002 and 2006), winning his re-election campaign by 39 points. Blackburn is likely to run as a Trump ally, but the president is not as popular in Tennessee as you might think, considering his margin of victory there in 2016: He’s only barely above water, according to most surveys. The MTSU poll put his approval rating in the state at 50 percent, with 41 percent disapproving. Morning Consult had him at 55-41 in March. 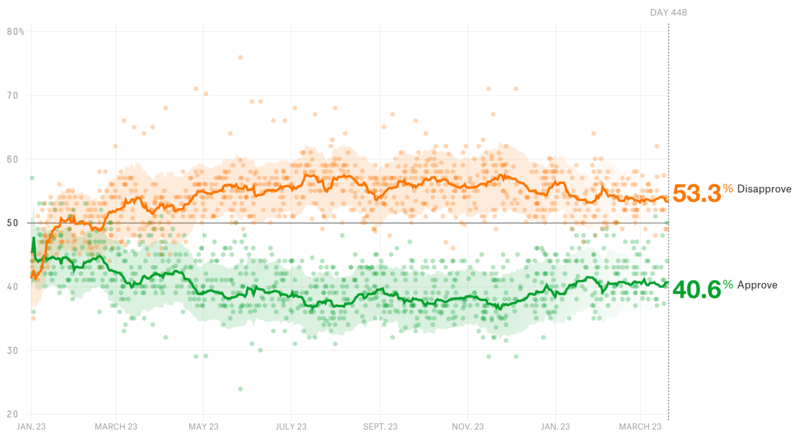 And Gallup, aggregating all their 2017 tracking polls, put him at 50-44. All of which is to say that Bredesen has a real chance — and Democrats could pick up a seat in the South that, not long ago, looked unwinnable. If a Democrat is going to win a statewide federal race in Tennessee in the foreseeable future, this is probably the time, when all the conditions are right: an open seat (i.e. no incumbent, and especially no incumbent Republican), an unpopular GOP president with lukewarm support even in the Volunteer State, and a strong Democratic candidate. Meanwhile, Arizona could have two Senate seats up for grabs this November. If the McCain seat is open, Arpaio, Ward or another candidate who might be too conservative for the state could switch to run in that race instead. It may be hard for more establishment Republicans in Arizona to lock the anti-establishment wing of the party out of both seats. Like in Arizona, Democrats are often enthusiastic about their chances in Texas but almost always lose in federal statewide races there. That said, Democratic congressman Beto O’Rourke outraised incumbent Republican Sen. Ted Cruz in the last quarter of 2017. And O’Rourke raised even more cash in the first quarter of 2018, a sign he’s waging a serious campaign. We don’t have any recent polls of this race, but it’s worth watching. Cruz has the advantage; Texas is still unquestionably a red state, after all. But his re-election can’t be taken for granted anymore. Case in point: The Cook Political Report moved the race from “solid Republican” to “likely Republican.” So did CNN. So Democratic prospects are looking better in Tennessee, Arizona and Texas. There is one race, though, where the outlook seems to be improving for the GOP: Florida. Gov. Rick Scott, a Republican, officially announced this week that he is challenging Democratic Sen. Bill Nelson. Everyone already knew Scott was going to run for the seat, but in such a Democratic-leaning environment, it’s gotta be a little reassuring for Republicans that a strong candidate like Scott officially took the plunge. Florida is about evenly divided between the two parties, so this was always going to be a close race, and polls have suggested Nelson and Scott are running neck and neck. The race may have even gotten a bit tighter in recent weeks, as only one of those polls was in the field after Scott signed a set of gun control measures into law last month in the wake of the school shooting in Parkland, Florida. That was a high-profile move, and one that might appeal to more moderate Florida voters in both parties. A poll out of Washington’s 5th Congressional District suggests that longtime Republican incumbent Cathy McMorris Rodgers will face some real competition. The poll, conducted by Elway Research, showed Rodgers with a 44 percent to 38 percent lead over Democrat Lisa Brown, with 16 percent undecided. A Quinnipiac poll found that 84 percent of Democrats have a favorable view of the Parkland students who have been calling for new gun-control laws, but only 22 percent of Republicans feel the same — 62 percent of Republicans have an unfavorable view of the students. The Quinnipiac poll, taken April 6-9, also found that 69 percent of Americans (including 55 percent of Republicans and 82 percent of Democrats) believe that President Trump should not fire Robert Mueller. A quarter of Facebook users believe that the service has made their lives better, according to a YouGov/CBS News survey. Eleven percent feel it has made their lives worse, and 63 percent feel that their lives haven’t changed either way. 39 percent of Americans believe that the GOP’s new tax law is benefitting them personally, according to a new Greenberg Research poll. There was a strong partisan divide in who agreed: 61 percent of Republicans vs. only 20 percent of Democrats. Missouri Governor Eric Greitens, who has been accused of sexual assault, is under pressure to step down. A Mason-Dixon poll conducted last week finds that 48 percent of Missourians think he should resign, 36 percent think he should not. Still, there was a large partisan divide in responses, with a majority of Republicans believing he should not step down. A Mason-Dixon poll of Missouri registered voters also found Republican Josh Hawley in a statistical tie with incumbent Democratic Senator Claire McCaskill, who is up for re-election in November — 45 percent of respondents supported McCaskill and 44 percent preferred Hawley, with 11 percent undecided. In addition, 17 percent of registered voters polled said they were not familiar with Hawley. A Washington Post poll found that 20 percent of adults have attended a political rally, protest or speech in the past two years. Half said they had signed a petition, 41 percent have boycotted a product or service for political reasons, 40 percent have contacted an elected official, 29 percent said they have contributed money to a political group or campaign, and 11 percent had volunteered for a political party or campaign. Americans are split on whether or not the U.S. has a responsibility to get involved in the conflict in Syria, according to a YouGov/Economist poll, but they are not split along party lines. Twenty-eight believe that the U.S. has a responsibility to get involved (including 36 percent of Democrats and 32 percent of Republicans), while 37 percent believe the U.S. does not have that responsibility and 35 percent are not sure. Harvard’s Institute of Politics poll found that 64 percent of 18- to 29-year-olds are more fearful than hopeful about the future of America. A survey of about 6,000 teenagers by the bank Piper Jaffray found that only 8 percent considered Facebook their favorite social media platform. Snapchat led with 45 percent, and Instagram (which is owned by Facebook) followed at 26 percent. 44 percent of pet owners buy birthday or holiday gifts for their pets, according to an SSRS poll. YouGov asked 31,000 Brits who their favorite member of the Spice Girls was. Baby Spice was the most popular, and fans of Scary Spice were most likely to describe themselves as feminists. Trump’s job approval rating is 40.6 percent; his disapproval rating is 53.3 percent. Last week, his approval rating was 40.2 percent, compared with a disapproval rating of 53.8 percent. 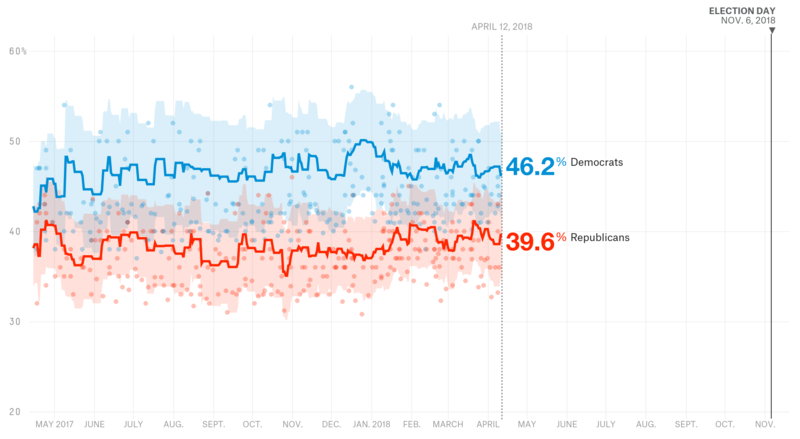 The Democrats hold a 46.2 percent to 39.6 percent advantage on the generic congressional ballot this week. Last week, Democrats were up 47.1 percent to 39.1 percent. That’s including independent Sens. Bernie Sanders and Angus King, who both caucus with the Democrats. OK, technically the poll — conducted from March 22-29 — was released late last week, not this week, but still. After May 30, although Arizona’s election laws are not very clear on this, it’s likely that Ducey could appoint someone who would remain in office without until a replacement was chosen in the next general election in 2020.